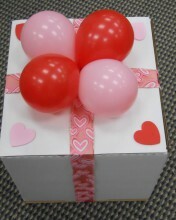 Tucked inside this beautiful Valentine box is a plush Valentine bear holding a 7 piece truffle sampler. All is surrounded by small heart-shaped balloons in red, pink and white. A great surprise for your Valentine. Click the button below to add the Valentine Surprise Box to your wish list.